"This is a good place for your work. Depression is a big problem here. About 70-80% of our people are depressed." When she arrived at the Flathead Reservation in Montana to start an ethnographic study of depression, medical anthropologist Theresa DeLeane O'Nell repeatedly encountered such statements. This astonishingly widespread concern propelled the author into the complex lives of these modern American Indian people and into the historical roots of their contemporary situation. In Disciplined Hearts, O'Nell draws on recent anthropological theory to locate Flathead depression in the culturally organized experiences of an oppressed people. According to O'Nell, Flathead narratives of depression are tales in which narrators use their demoralization as a guide for modern Indian life. Underlying their tales, she says, is the dramatic assertion that depression is the natural condition of "real Indians"—those who have "disciplined" their hearts by recasting their personal sadness into compassion for others. This rich account of family and community life describes the moral imagination with which Flathead Indian people weave together historical and personal loss, American Indian identity, and social responsibility. 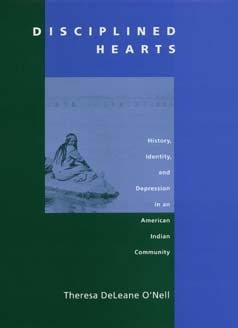 Based on her ethnographic and clinical work, O'Nell pinpoints American Indian depression within a complex interplay of cultural ideas of the self and the Indian family, emotion and ethnic identity, and historical relations between Indians and whites. Theresa DeLeane O'Nell is Assistant Professor of Psychiatry at the University of Colorado Health Sciences Center and Director of Ethnographic Research at the National Center for American Indian and Alaska Native Mental Health Research.